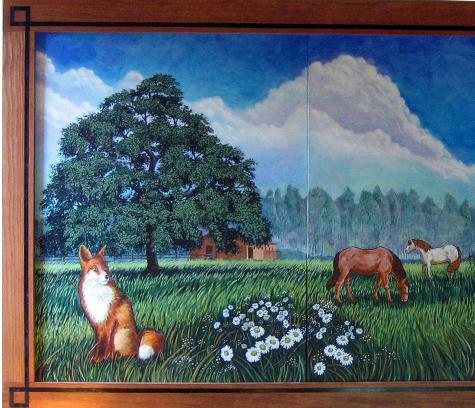 Please click the pdf files (left) to read the article about these murals. This article appeared in the Bucks County Courier Times, Sunday, August 24, 2008. The author is staff writer Gwen Shrift and the photographs are by Kim Weimer, staff photographer. 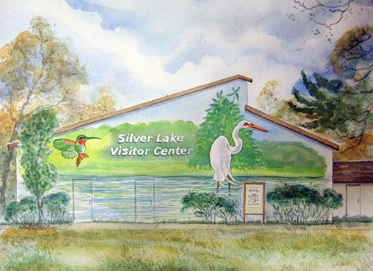 Silver Lake Nature Center (http://www.silverlakenaturecenter.org/) announced a public competition to decorate the outside wall of the Administration Building at 1306 Bath Road, Bristol, PA in the September 2007 Bucks County Courier Times Newspaper. Twelve local artists submitted original concepts for the competition. People living in the community were invited to an exhibition of the submissions for the express purpose of selecting their favorite design. The votes were counted and to my delight and surprise, my design was selected to go on the wall. 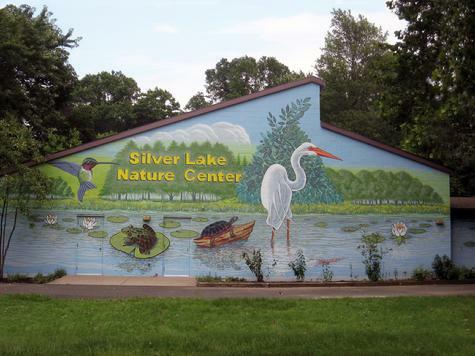 Silver Lake's wall measures 51 feet wide by 30 feet tall facing Bath Road in Bristol, Pennsylvania. 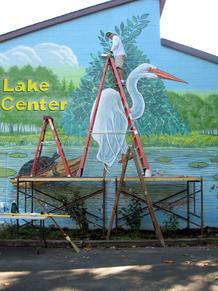 I started working on the mural in June, 2008 and continued until the weather changed for the worse in November, 2008. May of 2009 found me painting and I continued during the summer and into September, 2009. 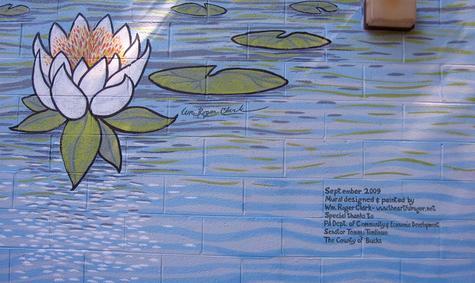 The painting on the main wall was completed and I signed the mural on Saturday, September 18, 2009. 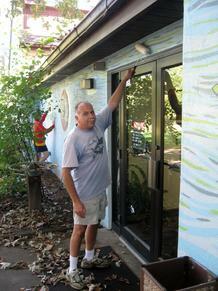 My friends, Jim, Rich, and Lynn pitched in on Friday, September 25, to cover the wall with Industrial UV protection. Pictures of the group can be seen among the above collection of pictures on this web site page. 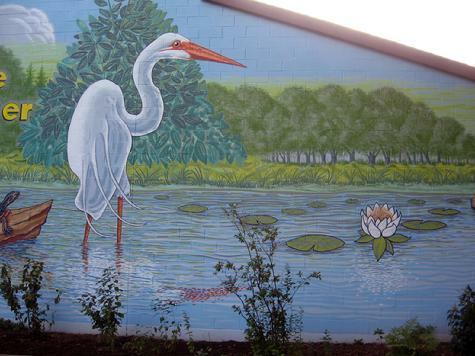 The following year I was asked to extend the mural along the walkway toward the main entrance and around the corner. I completed the extension in 2011. Constant maintenance will keep me busy for years to come. 2012 - the steel doors needed some touching-up and rust removal. I first met Jim and Pat Bono in 1990 when I joined the Folk Choir at St. Michael's Church in Levittown, Pennsylvania. 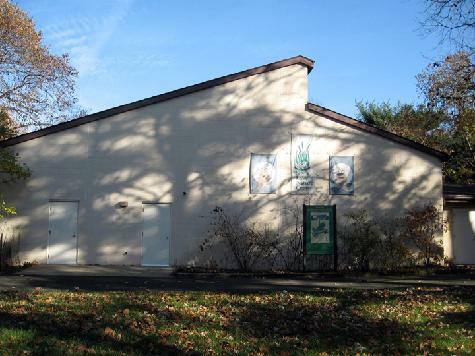 This was the year Jim and Pat made the decision to purchase a farm in Columbus, New Jersey. Columbus is in the heart of The Garden State's agricultural region. From then until now I have assisted them with various farming related jobs from mending fences, mowing, turning soil and planting seedlings, making signage for vegetable sales, feeding horses, and general maintenance. It is a wonderful experience and I love working outdoors. For many years we have made improvements to the farmhouse. One construction project added a Great Room to the original structure. This room has one large wall measuring 24'x18'. While building this room back in 1995 we discussed the possibility of painting a mural on this expansive space. After many years of discussion, sketches, watercolor preliminaries, and mock-ups, we purchased the materials at the end of 2005. 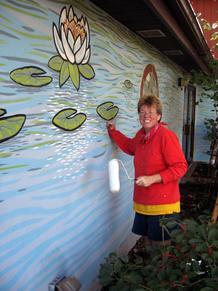 I began working on the mural January 2006. 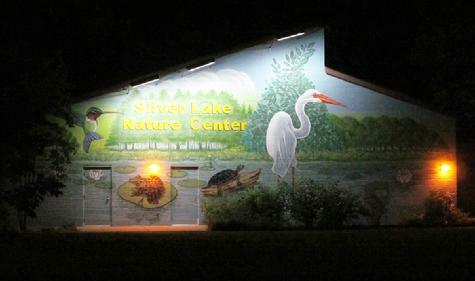 Below, are images of the completed mural. 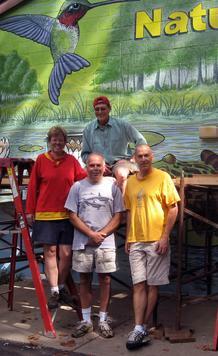 09/06/2008 Today I signed all three panels after adding the Red Tail Hawk in the sky. It has been two years in the making and I am pleased with the finished painting. It is time to celebrate with an unveiling get together party with family and friends. I thank God for the health, mind and heart to have completed this monumentally satisfying work of art. I thank Jim and Pat Bono for their trust and faith in me to design and undertake so large a project. I'll miss working at the farm every weekend. We'll have to come up with another art project. 11/14/2008 Jim and Pat Bono and I celebrated the completion of the mural with an unveiling ceremony on Saturday, November 1, 2008. In attendance were 60 friends and relatives. The unveiling took place around 2:30 PM. The painting was greeted with generous appreciation by all. It was a wonderful way to put the finishing touches on the most interesting creative experience I have had to date. Thanks to Pat and Jim, life is an aesthetic adventure at Wishing Star Farm. Thanks again. To read about the Artist please click here.